The streets of Brisbane's CBD are named after royalty. Male names run east-west and female names run north-south. I don't know how this quaint custom originated, but I quite like the idea of having some sort of naming convention. So, if it hadn't been royal names, what might it have been? First Ave, Second Ave, etc? Boring! (for anyone bar accountants and engineers, that is!) Aboriginal names? We do have plenty of suburbs that have aboriginal names, and although they have a lovely cadence to them (Coorparoo, Woolloongabba, Indooroopilly), most are too long to be useful as street names. "Meet me on the corner of Woolloongabba and Indooroopilly - I'll allow an extra half an hour in case you have to ask directions!" Maybe Aussie film stars? Flynn, Taylor, Finch, Kidman, Ledger, Watt. What? One of our northern suburbs has streets with film star names, but in any case, there weren't too many famous Australian actors around when the founders of Brisbane were deciding on street names. And, they weren't terribly original when they ran out of royal first names - try Creek St or Wharf St, for example. So, we are stuck with what we have - best enjoy them as much as possible, really. Here is photo that I love, taken in about 1920, and I guess that it may have been hand coloured, although there were early examples of colour film even then. In this image, you are looking down Edward St towards the Brisbane River. The large statue in the foreground is a memorial to the South African War, but it has now been moved to Anzac Square, and we will see it again, in its new position, later in this series. If you look further into the picture, you can see a smartly dressed Brisbane woman, and also a rather stylish tram of the era. The People's Palace, which was a low-cost, temperance (no drinking, smoking or gambling tolerated) establishment situated near Central railway station, is also visible on the right. You may need to look at the larger image (just click on it), but in the background you can see the ochre-coloured cliffs at Kangaroo Point. Now, here's today's image from the same vantage point. Proof that not drinking and not smoking does indeed prolong life, the People's Palace survives. It is now a backpacker's hostel, so it is fulfilling at least part of its initial charter! I bet that the no drinking rules have been relaxed, though, otherwise backpackers might be a little scarce :-) Edward St is now one-way towards the centre of town, and the electric trams are sadly no longer with us. High-rise office towers give a much more crowded feel to the street, but the Kangaroo Point cliffs are still just visible. Although I am happy with my own photo, I much prefer the ambience of the older version. What do you think? 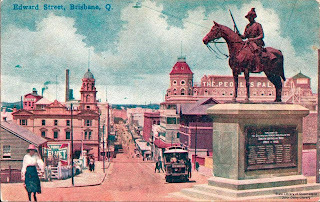 I also love the old photos of Brisbane, and am enjoying your blog very much. Thanks for stopping by again. The old pix are fun, aren't they! Your blog is a beaut read too. Wow! that really illustrates the progress from country town to city! I love it. What a great Blog! I am hoooked already. I have a bit of an interest in old postcards (as the Old Foodie will tell you) so to be introduced to your blog with a card I've not yet seen was fantastic! Keep up the great work! The Brisbane CBD street names are derived from the members of the house of Hanover - Queen Victoria's father George III, relatives and her husband and prince consort Albert. The male named streets run from east to west and the female names north to south with the queen and her consort Albert intersecting in the middle. Victoria came to the throne in 1837, two years before the 1824 Moreton Bay penal colony closed in 1839 and reopened as free settlement in 1842. Most of the original buildings were demolished (except for the windmill and comissariat store) and the streets were realigned to form the Hanoverian grid you see today. The two original bridges were Victoria to South Brisbane and Albert (the railway bridge to Ipswich at Indooroopilly). The house of Hanover left the British throne in 1901 with the death of Victoria and was replaced by the house of Saxe Coburg Gotha with the coronation of Edward VII. This was changed to Windsor (after Windsor castle) to rid the royal family of its German association during WWI. Thanks - great info there! Corrections: Prince Edward was Queen Victoria's father, hence Edward St. King William (William St) was Victoria's uncle. Victoria couldn't inherit the Hanover house as she was female. She took her mother's Sax Coburg title and this passed to her son Edward VII.